The name Mangalore (Mangaluru) is after the Goddess Mangala Devi. It is a home to many famous colleges of various disciplines due to which it is known by the name cradle of education in Karnataka. Apart from this, the city is a melting pot of varied culture. It is situated between the Western Ghats and the Arabian Sea. Over the years, Mangalore has been ruled by different dynasties and the monuments here are the live examples which portray diverse architectural skills. Mangaluru has turned into the business hub and even though it is not recognised as the metropolitan city, the culture of Mangalore is no different. This city is amongst the fastest developing cities in India. There are a number of malls present here and also the MNC’s prefer this city for their offices. Here, many languages are spoken due to the presence of diverse communities. It comes under the cleanest cities in India. It also contributes to the 75% of cashew nuts and coffee exports. The city has high literacy rate and Human Development Index. Tourist’s attractions in Mangaluru are a blend of old and new. Where on one hand there are temples and forts, on the other hand, there are great beaches that help you relax and go crazy. Tourists gather here in large numbers to be a spectator of the following attractions. Mangalore’s former name was Mangalapur but was later changed by British people. The former name was taken from the name of Goddess Mangala Devi to whom this temple is dedicated. It was built by the ruler of Ahepa Dynasty in the 19th century. This temple is dedicated to Lord Gorakhnatha which is another name for Lord Shiva. Devotees flock here during their major festivals. The architecture of the temple is of Dravidian style and you can also see the fine looking carvings and sculptures in this temple. Panambur Beach remains crowded with tourists and natives too. The beach is safe for swimming too. It is most preferable place amongst the natives of Mangalore who wish to cool and relax. It is 13km away from the main city. This beach is famous for its lighthouse and smooth sand which comforts people walking barefoot. It is a lovely beach and the scenic beauty soothes the tourist’s heart and soul. This fort is built on a granite hill and is 1700ft above sea level. Jamalabad Fort is also a trekking destination. It is 65km away from Mangalore. There is a narrow path with more than thousand stairs that leads to the fort but all your efforts in reaching up there will not go in vain. The beautiful view from the top will surely cast a spell on you. It is an important pilgrim centre for people following Jainism. It is approximately 52 km away from Mangalore. The major attraction here is the 42ft high deity of Lord Gomateswara which was established here in 1432. The path that leads to Kateel is surrounded by rich green vegetation. The journey amidst the beautiful valley in addition to the soothing weather is craved by many. It is situated 30 km towards the North of Mangalore and over the years, it has turned into a tourist attraction. The church was built in the year 1680 by Vicar Thomas de Castro he was a Theatine Priest of Salsette. It is one of the oldest churches in South Canara. The piece of land to build the church was gifted by Keladi Queen Chennama. The present structure dates from 1911.Some parts of the church are believed to have been destroyed by Tippu Sultan and the stones were used to build the Idgah on Lighthouse Hill. 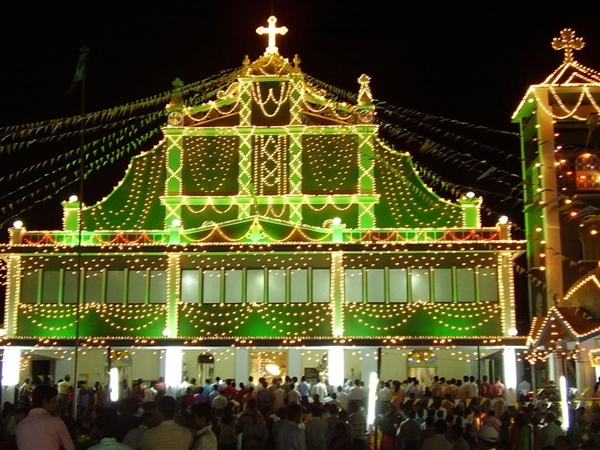 Milagres Church has a great altar and is considered one of the best prayer house in Mangalore. The Church also houses the paintings of St Monica and St Augustine which is a wonderful piece of work is a worth watch. Holy Rosary Church or Rosario Cathedral is one of the oldest churches situated near Hampankatta. It was built in the year 1568 by the Portuguese and reconstructed in the year 1910. Diego de Silveira the Portuguese King his stone emblem here marked the landing of the Portuguese in Mangalore can be seen at the entrance of this church. It is known for its magnificent dome which resembles St Peter’s in Rome. There are as many as 8 bishops, including one archbishop interred here. Located on JM Road, Juma Masjid may have been built around 644 AD by early Arab traders who came in search of the famous Malabar spices. Tipu Sultan the famous ruler of Mysore is credited to have renovated in the 18th century. The mosque has carved intricately wooden roof. The prayer hall is the main attraction which is a rectangular platform which is 3 ft above the ground. This mosque also marks the arrival of Islam in this region. It is also called Masjid Zeenath Baksh. It is the city’s only museum, which links modern Indian history with the 16th century objects. Col VR Miraskar Mangalorean by birth during one of his posting in pre-Independence India had stayed in a bungalow he liked it so much that he built an almost exact replica of it at Bejai. Later the State Archaeological Department converted the bungalow into a museum. The museum is named after the Colonel’s mother with many of the exhibits from his own collection he has collected over 40 years. The house has three floors and its huge teakwood caskets filled with Artifacts ranging from ancient coins, second century stone idols, 18th century brass images, lamps, life-size wooden figures can also be found. You can also find pottery, porcelain and glass from China and Japan. Reaching Mangaluru is an easy task since it has links to all the major cities of India. Mangalore possesses a rich network of flights which makes it easy for the tourists to fly here. Mangalore International Airport is around 20 km away from the city centre. There are cabs and taxis available just outside the airport to take you to your desired location. Mangaluru is blessed with two major railway stations namely, Mangalore Junction which is around 5km away from the centre of the city and Mangalore Central that is located in the heart of the city and provides great connectivity. Cabs and taxis could be availed according to your requirements. For those opting for bus services, the city has two major bus depots also. There are many private buses running that can drop you here. Moreover, brownie point for travelling via bus is, that it has many pick-ups and drop down options and could be chosen as suitable for you. For those who are travelling by car, highways are very narrow and you might get stuck in traffic. There are many companies available that provide rental cars.